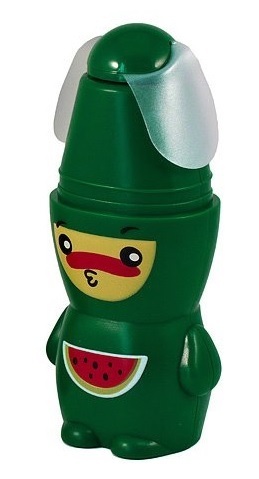 OUR NEXT WATERMELON PRIZE: THE WATERMELON FAN! - What About Watermelon? You are here: Home / Prizes / OUR NEXT WATERMELON PRIZE: THE WATERMELON FAN! I went camping this past weekend, and the weather was actually pretty nice. A little warm – maybe even what you’d call “hot” – which is why I was glad my wife convinced me to pack an extra cooler full of drinks and watermelon. You didn’t think I’d go camping without watermelon, did you? I fell in the creek while I was fishing, which helped me stay relatively cool (even if I looked decidedly uncool while I was flailing around in the water), but I could have used this week’s watermelon prize, too. I’ll give it away to one commenter chosen at random from all the comments left on the blog this month. Good luck…and, if you go fishing any time in the near future, don’t forget to wear a life jacket. Don’t forget to enter your best watermelon carving in our 2014 Watermelon Carving Contest! The deadline for entries is August 4. There are $2,000 in prizes and the first 25 entrants will receive a Dexas watermelon cutting board. Check out the contest kickoff blog entry or official contest web page for categories, entry requirements and more details. My husband is always looking for good watermelon prices during the summer. For him and I there is nothing as good as coming home after a walk after dinner and having a bit of cold cut up watermelon. Seriously the cutest thing ever! Love it! That’s so Cute,would love it to carry my water with me in. The winner of our week two prize is Janice! Congrats Janice!